Blessings, Miracles, &Thoughts in Between: Santa! I have been dreaming about the day I would take my child(ren) to meet Santa since 2008 when Alex and I started trying to have a baby. Thanks to infertility and major illness, it took 4.5 LONG hard years to make this dream come true. And so very normal. Oh my have I missed normal! 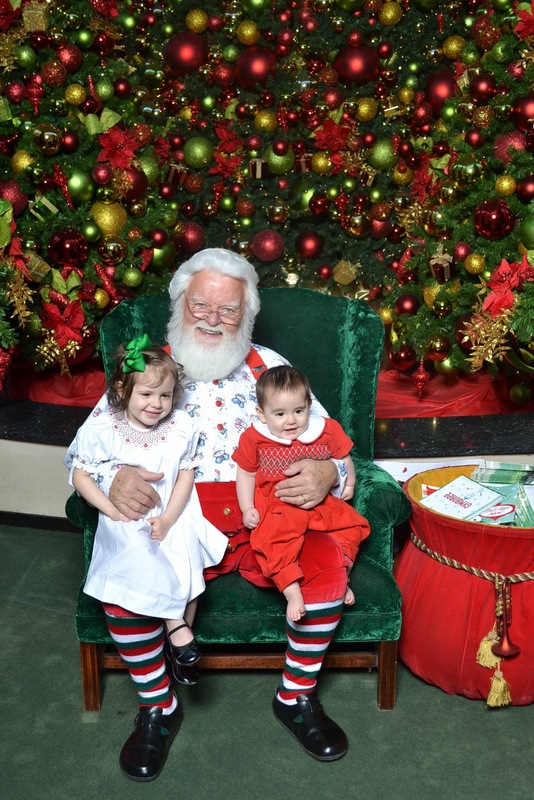 This is the first year that Kate has been medically "cleared" to meet Santa. 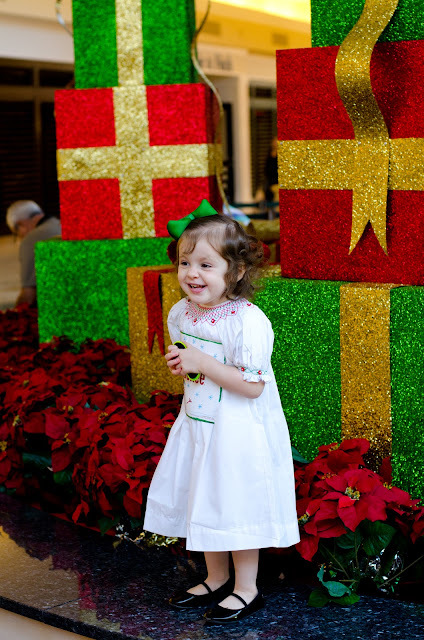 In 2010, her ANC was extremely low, we were searching for a diagnosis, and encouraged to not take her near a germy Santa. In 2011 she was just a few months post transplant. In 2012? She is a THRIVING two year old that desperately wants Santa to bring her a pink bike. You better believe she will have a pink bike waiting for her Christmas morning! After Kate's horrific less than stellar reaction to all of the characters at Disney (side note: I've finally started working on Disney posts - should be up by next week) I was so worried that Santa was going to be a gigantic bust but Kate surprised me! Yes the kids are looking at me and not the camera. BUT! Both kids happy? And smiling? It's a Christmas miracle! 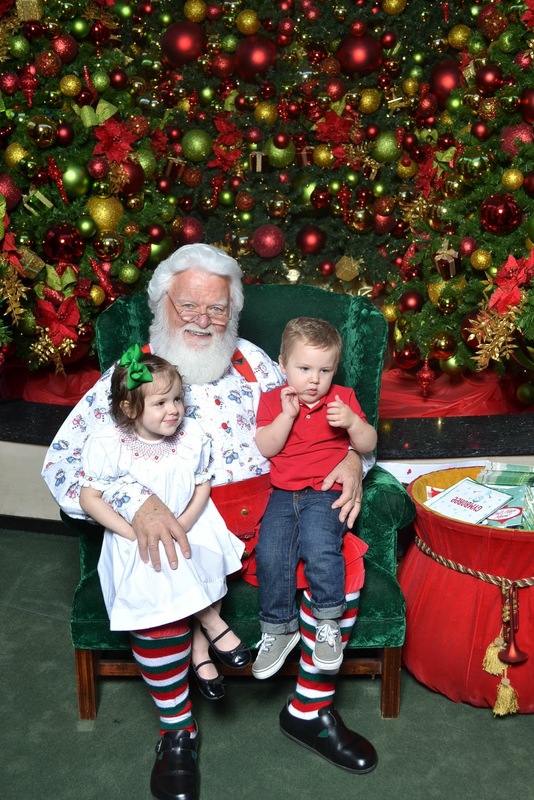 Kate even got to see Santa with her best friend, and fellow transplant survivor, Colt! 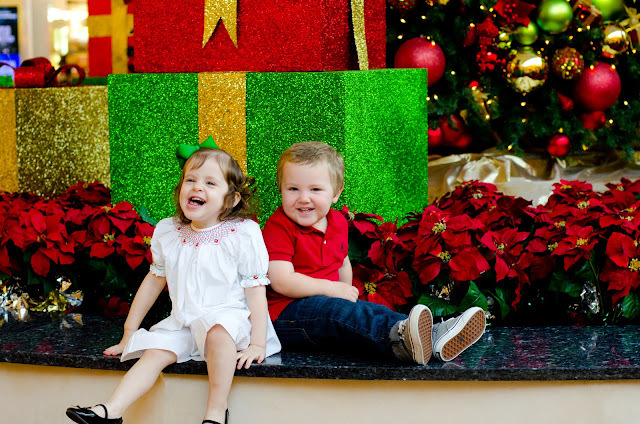 I took some pictures of these two after meeting Santa. They keep me laughing! This picture is totally unposed. Kate was determined to read Colt her new book! Thinking about how far they have both come since last year brings tears to my eyes. It really is so amazing! Kate loved all of the Christmas decorations too! She loved them so much that she picked a poinsettia and hid it in Colt's stroller so she could take one home! We laughed so hard when we discovered the stowaway! I'm so glad we visited Santa early so that we could avoid lines and germs! Have y'all visited Santa yet? Was it a success or a bust? 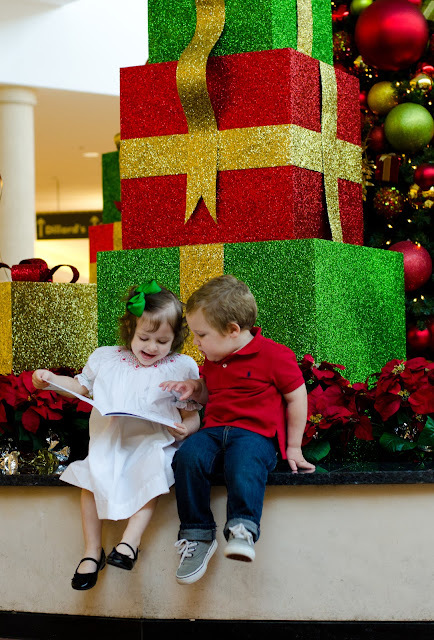 And to any Houston readers, we were at Bay Brook Mall - loved Santa - he was so great with the kids and so nice! That is the cutest Santa I have seen! His socks, they kill me!! I'm so glad that both of your children were able to meet Santa this year. Heres to many more years of Santa pictures!! Our three kids got to see Santa at Zoo Lights in Fresno and it was a no go. We ended up having to hold our two year old twins. Of course our nine year old was fine. I am hoping to get a parent and crying free picture done with Santa when we take the kids to Bass Pro in the next couple of weeks. We have never been successful with Santa before. But this year Sydney keeps asking to see Santa. So we will have to find a good one and take her to meet him! Have you done a portablenorthpole Santa video for Kate yet? I'm so glad I found your blog again! I first came across it in late 2010/early 2011, your daughter, Kate, was having health issues. My daughter was born in November 2010, and I couldn't imagine what you must be going through....I remember worrying and praying for you and your family, and checking your blog often for updates. 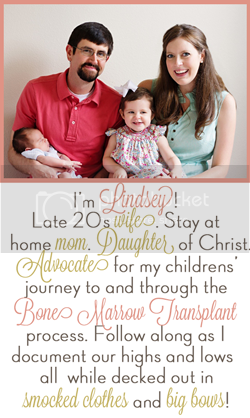 Your daughter's story is the one and only reason I registered to receive a swab kit and become a potential bone marrow donor. I didn't even know about the registry prior to reading your blog. Anyway, I wanted to thank you for making me aware of this opportunity to give - on Friday, I found out that I may be a potential match for a leukemia patient. I still have to go through the additional testing to make sure I'm an exact match, but the first thing I thought when receiving the notification was to find and thank you. I think the only other times I've been this excited about something is when I learned of being pregnant with my 2 babies. I can't thank you enough for sharing beautiful Kate's story...I'm thrilled to see what a amazing little girl she is today. I hope you have the most magical of holidays with your beautiful babies and family. The Baybrook Santa is the BEST!!! He's so sweet!! Lila loved him each year, but I knew that my little Alli would freak this year. She started the stranger anxiety about four months ago :( Our santa pic definitely shows their personalities. what a blessing!!! and love the picture you got. they loved him!! !